Affordability is crucial to the success of solar power. The sun has always been up to the task of powering our planet, with enough sunlight reaching Earth every hour to supply our energy needs for an entire year. However, humans have yet to find a way to convert light into energy sufficiently cheaply and efficiently. Read about World Community Grid and the Harvard Clean Energy Project, which recently released a database of 2.3 million organic compounds — 35,000 of which have promising properties for high-performance semiconductors that developers could use to make affordable photovoltaic cells. Solar panels. Image courtesy Swiss Metal Assets. The dream of a solar-powered world recently took a major step forward. On 24 June, in a joint announcement with the US White House and IBM, the Harvard Clean Energy Project released a database of 2.3 million organic compounds - 35,000 of which have promising properties for high-performance semiconductors - that solar-power developers could use to make affordable photovoltaic cells (PVCs). In the spirit of open science, the project provides the Harvard Clean Energy Project Database (CEPDB) free of charge to the public and researchers. Affordability is crucial to the success of solar power. The sun has always been up to the task of powering our planet, with enough sunlight reaching Earth every hour to supply our energy needs for an entire year. However, humans have yet to find a way to convert light into energy sufficiently cheaply and efficiently. Today's commercially available solar cells are typically made of inorganic semiconductor materials, such as silicon, and require a lot of energy and capital to produce. The Clean Energy Project's announcement is a potential game changer. Led by Harvard quantum chemist Alán Aspuru-Guzik, the project seeks to develop candidate molecules for high-performance solar cells made of plastic. These materials can be made in the form of sheets, films, and coatings - imagine powering your home with PVCs painted on the roof. But how do scientists determine which molecules - out of millions of possible combinations - will most efficiently absorb light and convert it into electricity? For Aspuru-Guzik, the answer was clear: run computer simulations through World Community Grid, the world's largest nonprofit computing grid. This IBM-sponsored initiative allows anyone who owns a computer to install secure, free software that uses the machine's spare compute resources when it is idle. All of the WCG's sponsored projects help humanity in some way, and the scientific results are available in the public domain. In addition to the Clean Energy Project, volunteers with the World Community Grid are donating their computing time to help fight malaria and childhood cancer, find clean water, and cure muscular dystrophy. Wold Community Grid statistics as of May 15, 2013. Image courtesy World Community Grid. "I've always liked the idea of the World Community Grid, ever since my undergraduate days back in Mexico," says Aspuru-Guzik. "Yes, I could use a standard supercomputer if I spent a lot of time asking for computing cycles from the computer centers, but why not involve people and have them help you? That human aspect of the World Community Grid is irreplaceable." Aspuru-Guzik said he needed to think big when he started the Clean Energy Project's collaboration with WCG. "Our biggest challenge was the change of mindset. Usually, computational chemists who try to do this type of thing are studying 10 or 20 molecules at a time. We had to start thinking in terms of millions of molecules and formulate new ideas based on this new scale. The World Community Grid allows us to screen about 25,000 molecules every day. That gives us the opportunity to explore the molecular space, and learn about some crazy molecules that could be good organic materials." This is music to Viktors Berstis' ears. As lead scientist for World Community Grid and IBM Master Inventor, Berstis makes sure that researchers get the most out of WCG. "Scientists instinctively try to reduce the size of their projects," he explains. "They have limited budgets and limited computing time. At the World Community Grid, we help them imagine what they could do with a ridiculous amount of computer time. Partnering with us gives the researchers the equivalent of one supercomputer all to themselves, 24/7, year after year - helping them make much better progress on their science." To date, more than 600,000 people around the world have joined the World Community Grid, donating their idle computing time to help researchers like Aspuru-Guzik find solutions to some of the world's toughest challenges. The Clean Energy Project alone just passed 17,000 cumulative CPU years of computing time. 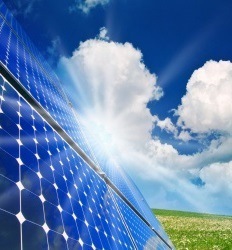 As a result, plastic solar cells may be one step closer to becoming a reality. "The potential benefit of finding just the right chemical compound for cheap and efficient PVCs could save the world," says Berstis. "We'll likely run out of fossil fuels in about 100 years, putting us on a slope to catastrophe - the way to solve this problem is to make use of renewable energy."